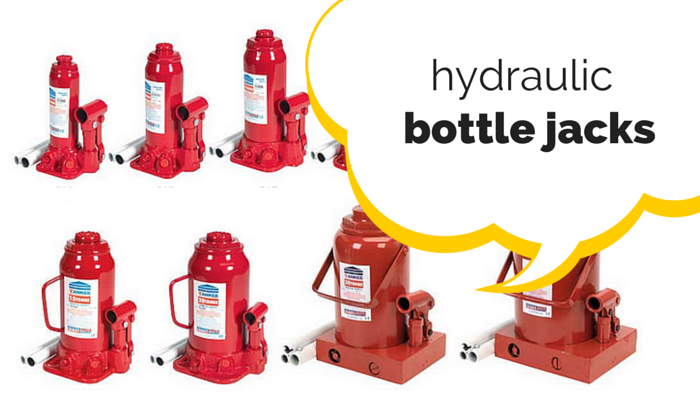 Hydraulic jacks are used in a wide range of industrial areas, primarily motor and workshops environments, one type of hydraulic jack is the bottle jack. A bottle jack is called so due to its similarity in shape to a bottle. It features a hydraulic ram, working on a single action piston which coverts energy into motion to allow the object to be moved or raised, allowing for a reasonable amount of height clearance. What is the benefit of a bottle jack? The other benefit of the bottle jack is the size, due to its bottle like shape; it can fit into small areas or be stored away without using up too much space, which is helpful when working in tight spaces and smaller workshops. You can also lift the object to full height over different stages, which gives you a lot of versatility whilst working, especially in garage or workshop environment. What capacities of bottle jack are available? The bottle jacks have a capacity of between 2 tonnes to 50 tonnes. There is also a telescopic bottle jack available too in 2 and 5 tonne capacities, this allows a reduced closed height without affecting the maximum lift height. You can find our full range of bottle jacks on our direct website. If you do have any questions relating to bottle jacks, or any of our products please do not hesitate to contact our customer service team on 0808 163 3704.